What type of creature created this series of splashes on the surface of the Red Clay Creek? Image by Derek Stoner, March 2, 2012. 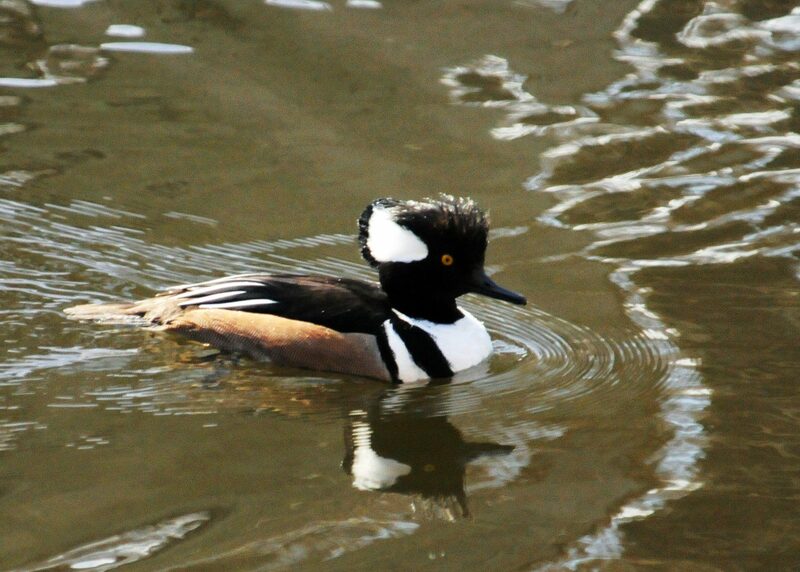 Not only have Wood Ducks provided an interesting show along the Red Clay Creek recently, but there is also another display being made by waterfowl visiting the Red Clay Valley. 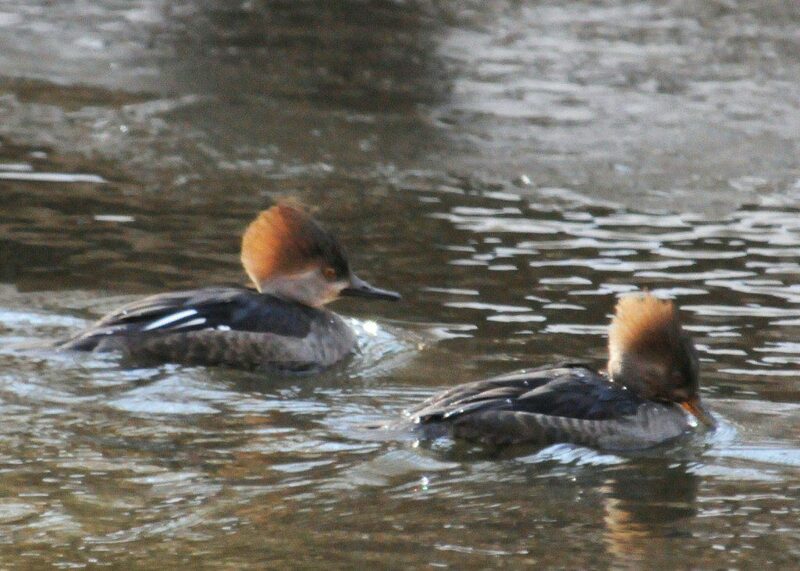 Male and female Common Mergansers are paired up and fishing together, fattening up on fish to fuel their migration north to the Boreal Forest. These large ducks will soon return to nest in the North Woods, where the females select nest cavities in hollow trees in the same fashion as Wood Ducks. 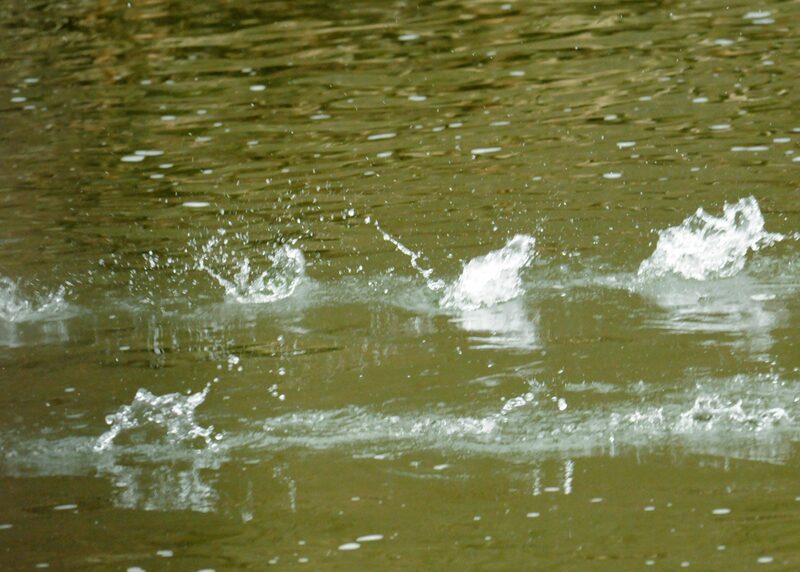 After a recent encounter where my camera was ready and the road behind me was quiet, the photo above shows the result: the series of splashes these birds left on the water’s surface as they flew away. 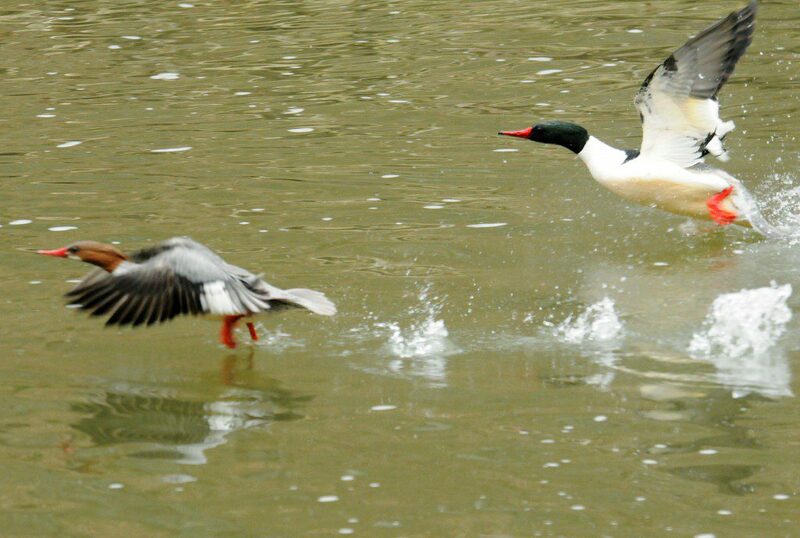 A pair of Common Mergansers (female left, male right) makes a running take-off from the Red Clay Creek. Image by Derek Stoner, March 2, 2012. 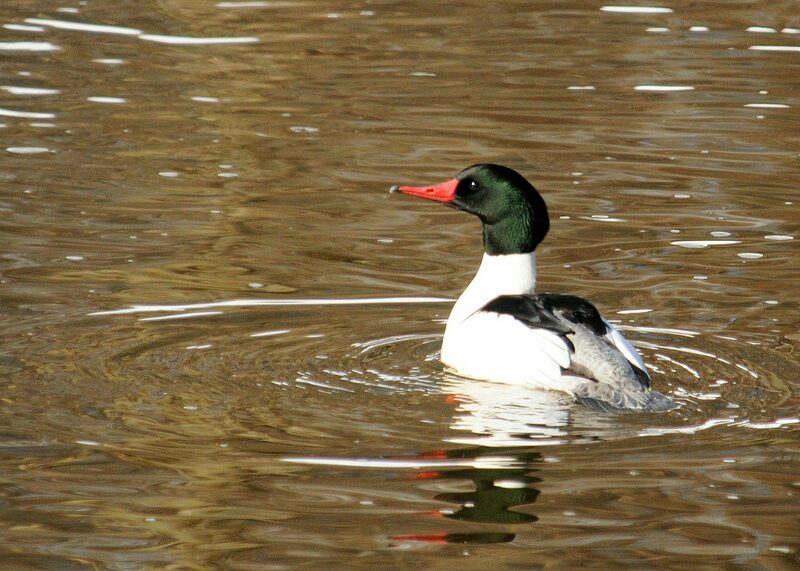 Because mergansers spend so much time in pursuit of finned prey, they have feet that are mounted closer to their tail than the average duck, in order to maximize propulsion while underwater. Like feathered skin divers, these birds chase after native fish like Black-nosed Dace, Creek Chubs, and Satinfin Shiners in the Red Clay Creek. 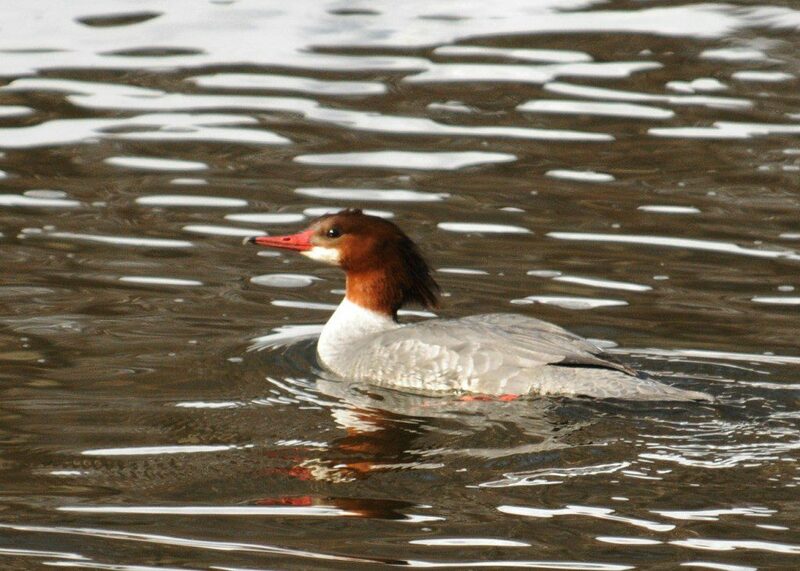 When mergansers decide to fly, they take a “running start” across the water and use their narrow wings to help them to slowly launch from the water. Keep an eye out on local waterways these next couple weeks for the colorful Common Merganser: a unique tree-nesting, fish-eating duck of the Far North! 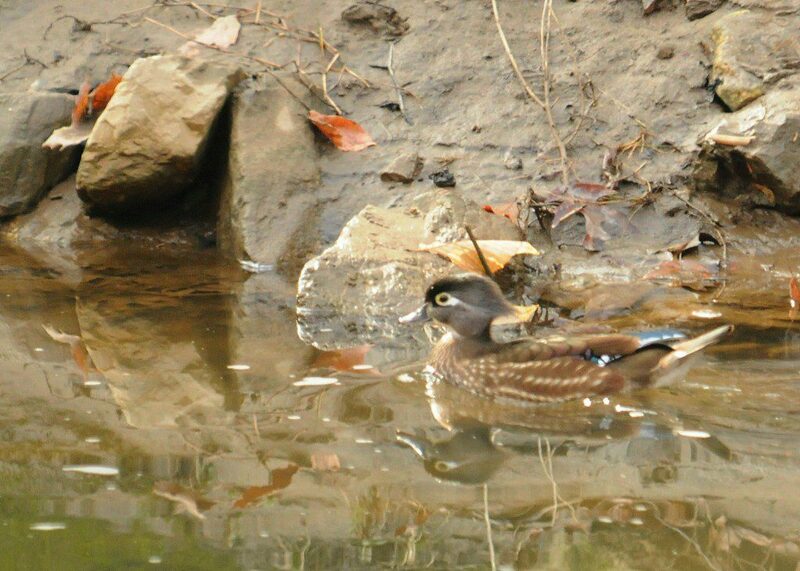 A handsome drake Wood Duck in a vernal pool along Red Clay Creek, following his female companion (tail visible at right edge). Image by Derek Stoner, March 2, 2012. There may be plenty of room to debate what bird wears the crown of “Most Beautiful” but I think a lot of voters would happily cast their ballot in favor of the Wood Duck. When these ducks arrive from their wintering grounds in the Deep South they are a most welcome reminder that the seasons are changing. Known by a nickname of “Summer Duck,” Wood Ducks are a symbol of the warm season that follows their return. Today I chanced upon a beautiful drake Wood Duck and his mate as they explored a vernal pool along Route 82 just up the Red Clay Creek from Ashland Nature Center. Amidst a setting of freshly-emerged Skunk Cabbage and last fall’s brown leaves, the drake’s plumage exhibited every remaining hue of the color spectrum. The Wood Duck hen’s mottled brown plumage disguises her in woodland and stream settings alike. Image by Derek Stoner, March 2, 2012. After the Wood Duck pair flew from their roadside puddle, I noted that the water contained multiple Wood Frog egg masses. Chances are good that these ducks took advantage of these eggs as an easy source of protein, to supplement their favored diet of acorns, grass seeds, and aquatic vegetation. 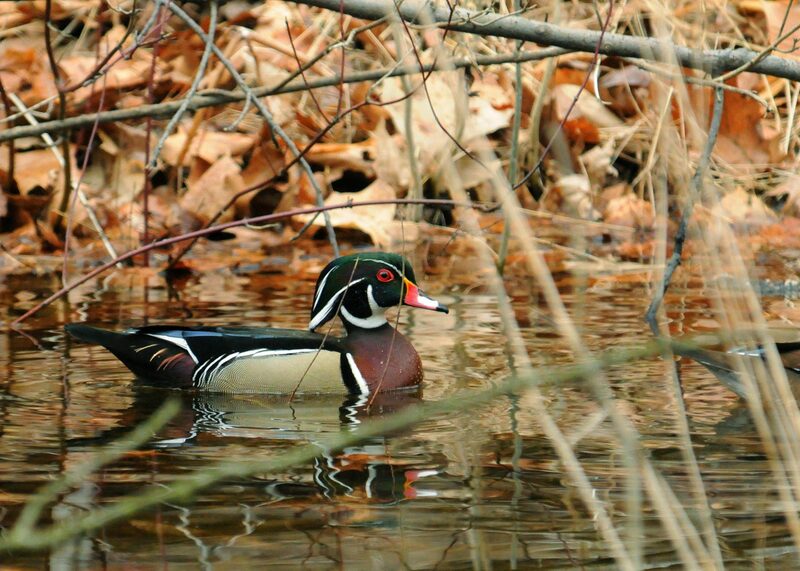 Watch for Wood Ducks right now as they begin to arrive on our local streams and marshes. Soon they will be investigating nest boxes and preparing for another “Summer Duck” season of raising young!